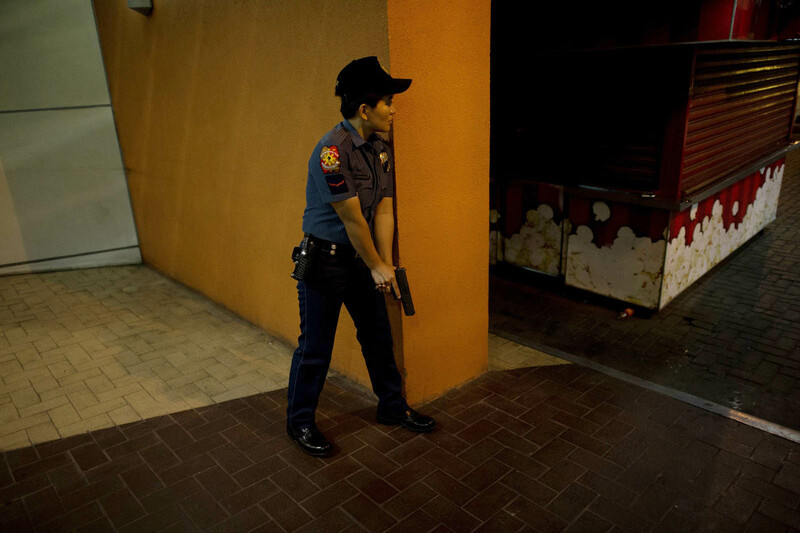 A member of the Philippines police special weapons and tactics unit holds an assault rifle outside one of the world’s largest shopping malls following an attempted robbery on a jewellery store inside in Manila. MANILA, Philippines - Sunday won't stop their nefarious activities. 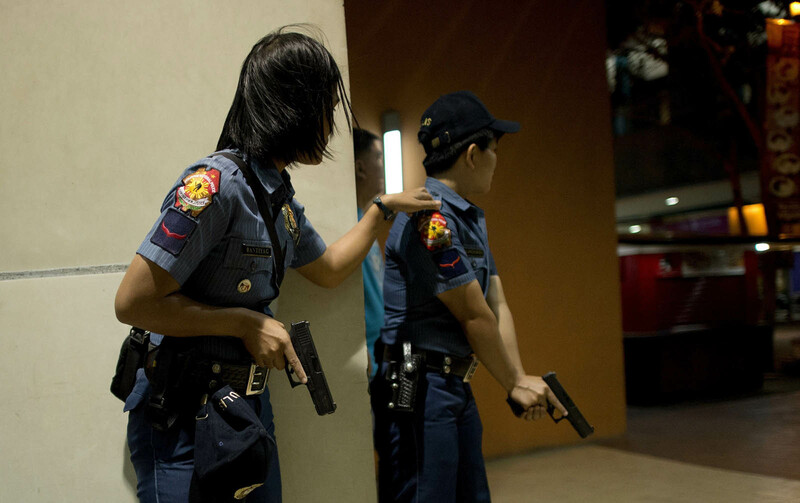 A band of robbers armed with guns and hammers shot it out with Philippine police inside one of the world's largest shopping malls Sunday, sending Manila shoppers scrambling for safety, police and witnesses said. 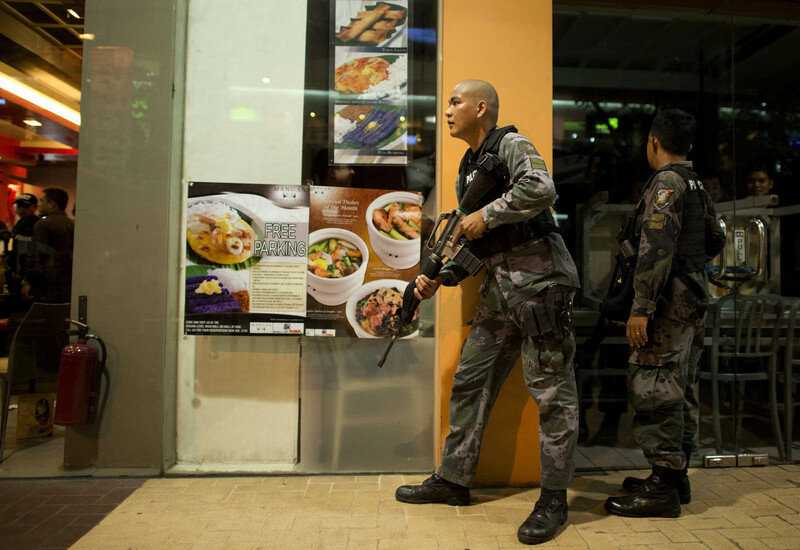 Waves of police commandos in bullet-proof vests and helmets and armed with assault rifles stormed the SM Mall of Asia (MOA), an AFP photographer saw, after the gang entered a jeweler's shop inside. 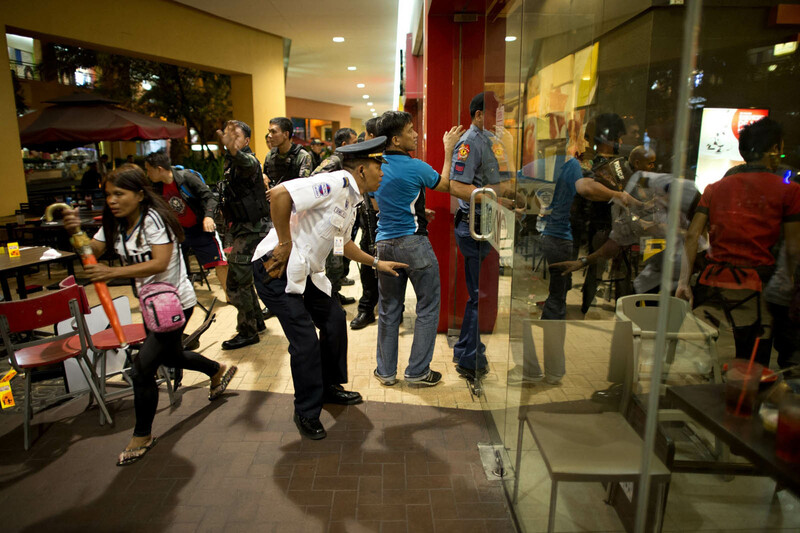 Chief Superintendent Jose Erwin Villacorte, Southern Police District chief, said witnesses saw five to six men storm the mall, ransacking a jewelry store on the ground floor by destroying a display case with hammers around 7.30 pm. 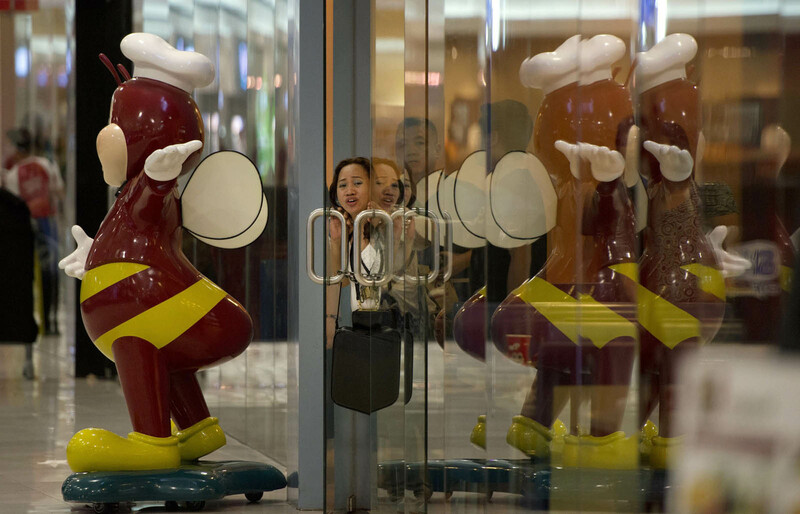 Two men were seen smashing the glass cabinet of the jewelry store. 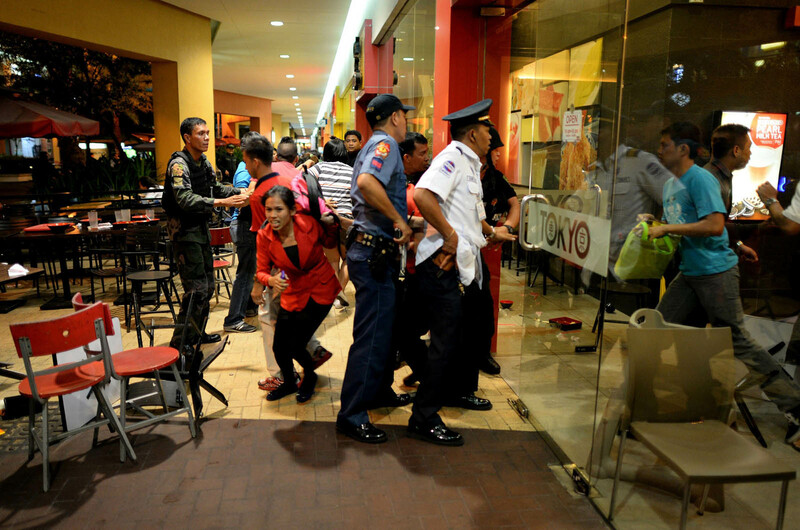 Hundreds of frightened shoppers, waiters and store clerks ran for dear life amid gunfire toward the exits of the nearly four-hectare (10-acre) complex of department stores, boutiques, restaurants and entertainment establishments by Manila Bay. 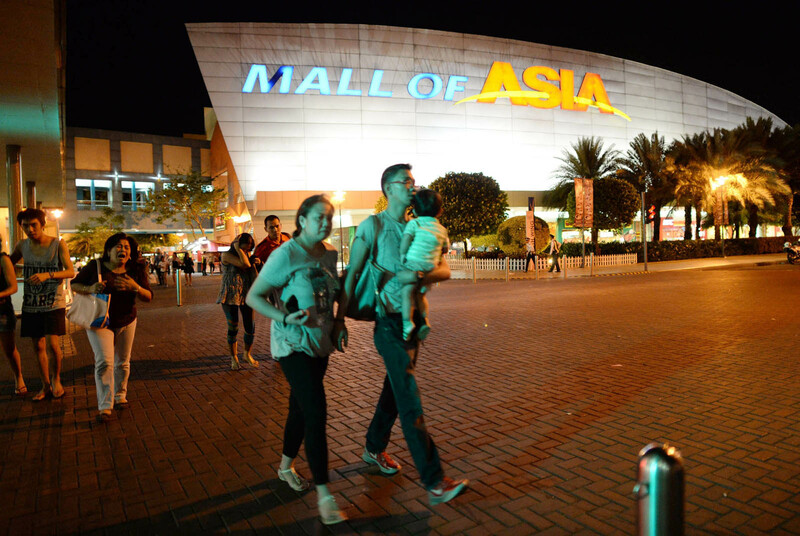 Philippine Daily Inquirer Lifestyle editor Poch Concepcion, who was shopping at MOA, said the mall's supermarket was locked "due to security reasons." Office worker Stacy Mercado, 32, told Agence France Presse: "We were in the grocery when we heard gunshots. We ran for the door immediately and my wife nearly fell with our 10-month-old boy." "The security guards initially blocked us, apparently because they feared some of us would steal items off the shelves on our way out. But they were swept aside after another burst of gunfire," he added as the family of three watched the unfolding police operation in early evening behind yellow police lines outside. The AFP photographer said he saw several people screaming or crying, including parents who told him they had been separated from their children or other family members in the ensuing chaos. 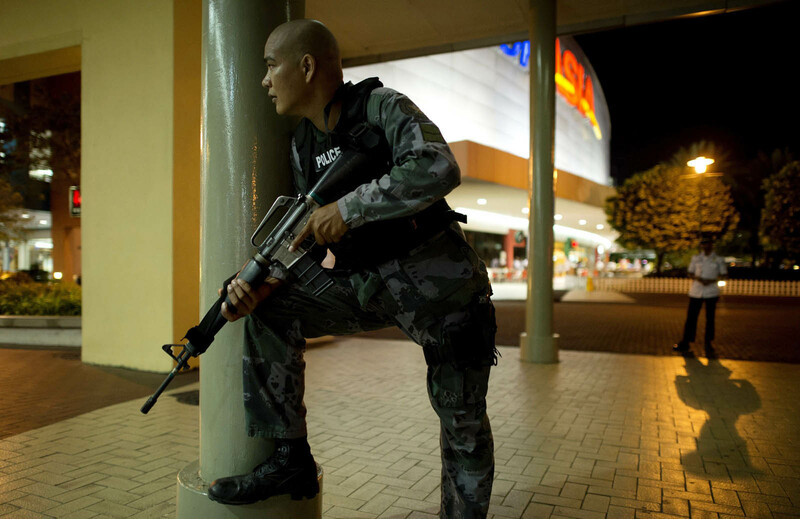 "Mall [security personnel] are working with the PNP on the situation and no one was hurt from the incident," Steven Tan, senior vice president for operations of the SM Supermalls, was quoted in the mall franchise's official Twitter account. One of the robbers fired shots to trigger a commotion among the people and distract the security guards, Villacorte said. He said, "Four of our policewomen were able to give chase to the robbers," in the course of which one suspect was arrested. The rest of the gang apparently escaped. Police said no one was seriously hurt in the firefight. Asked how much the robbers managed to take from the jewelry store, Villacorte said: "They could have scooped out jewelry from the glass cabinet." "This is a common tactic. These robbers would go into a shop and start smashing the display cases with a hammer to grab things inside," Villacorte told local television station ABS-CBN in an interview. 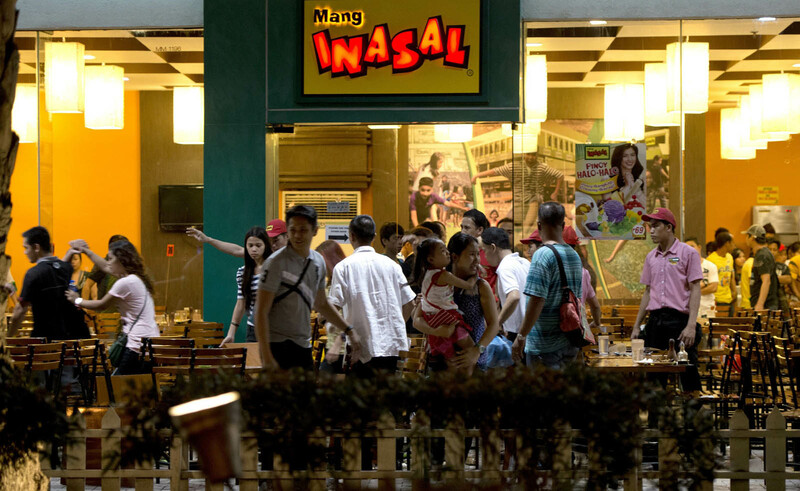 Several other Manila shopping malls have been attacked in similar fashion in recent years, which led the interior ministry last December to ban Manila malls from selling hammers. Opened in 2006, the Mall of Asia has 407,000 square meters (4.38 million square feet) of retail space, making it the country's second-largest, as well as among the world's largest, shopping destinations. Mall of Asia is part of the SM Supermalls retail chain controlled by the family of Henry Sy, the Philippines' richest man. 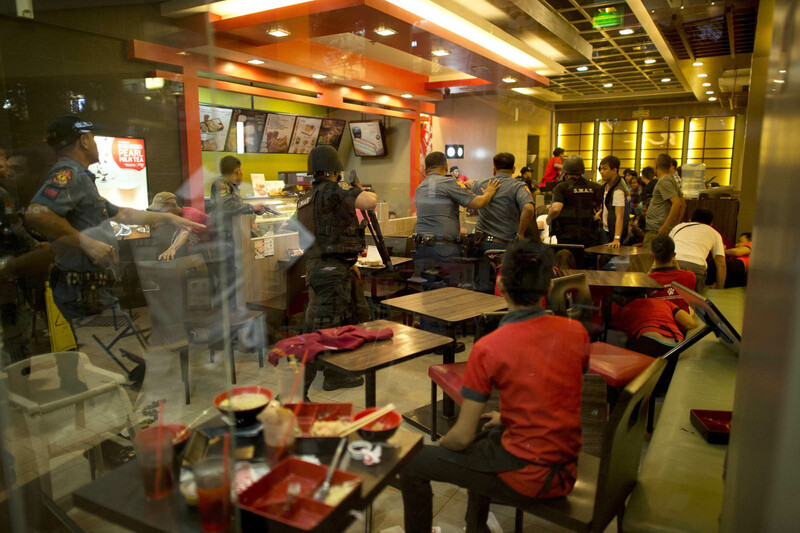 Diners rush from a restaurant as an officer from the Philippines police moves towards the scene of an attempted robbery on a jewellery store inside one of the world's largest shopping malls in Manila. One suspect was arrested in the resulting firefight, that caused hundreds of shoppers to stampede out of the mall. 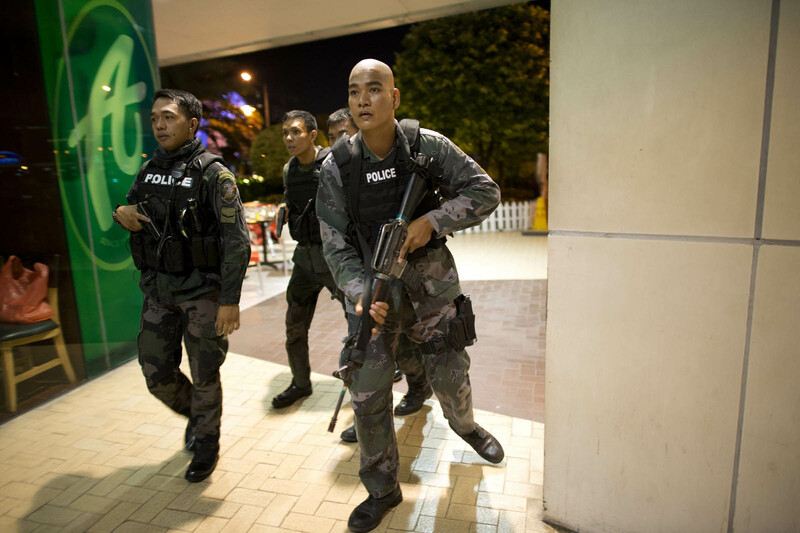 Police and the operators of the SM Mall of Asia said no one was seriously hurt in the incident. 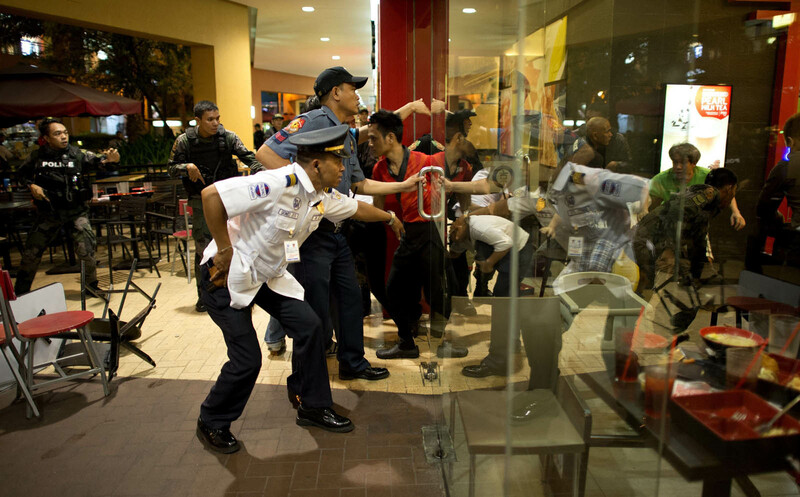 Chief Superintendent Jose Erwin Villacorte, Southern Police District chief, said witnesses saw five to six men storm the mall, ransacking a jewelry store on the ground floor by destroying a display case with hammers around 7.30 pm. Hundreds of frightened shoppers, waiters and store clerks ran for dear life amid gunfire toward the exits of the nearly four-hectare (10-acre) complex. 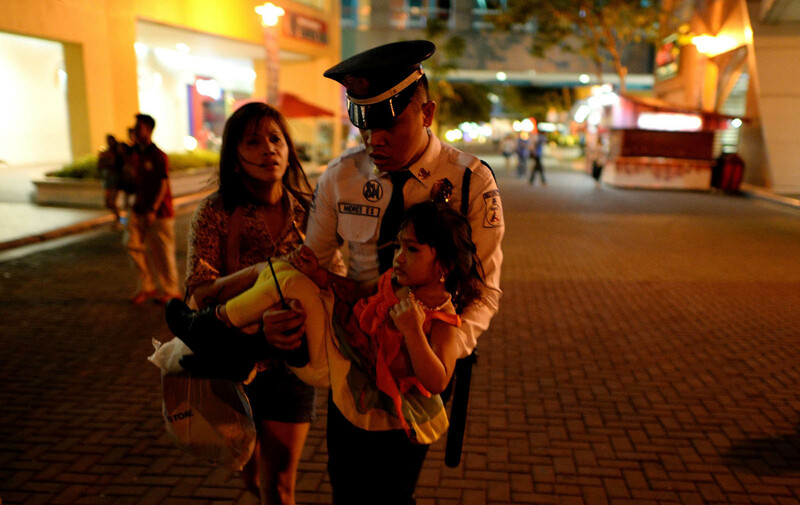 A Philippines shopping mall security officer carries a child out of the Mall of Asia.